STEM is the “buzz word” in education right now and rightfully so. Our young children need even more opportunities to play, explore, and learn about science, technology, engineering and math. It is my belief that starting early exposure and getting kids excited about STEM, will help prepare them for future life challenges. Co-author Jamie Hand and I believe that art is integral to all of the STEM areas and so STEM + Art = STEAM. This week, we are sharing tips on what preschool engineering looks like, how to get your children building every day, and our engineering activity challenge for all parents, teachers, and care-givers of preschoolers. Join In! Check in Question for Week 3: What building material did your child select? Preschool engineering takes form though play and material exploration. It is designing, problem solving, and building. How can you encourage engineering every day? Challenge them to come up with multiple solutions to the problem. 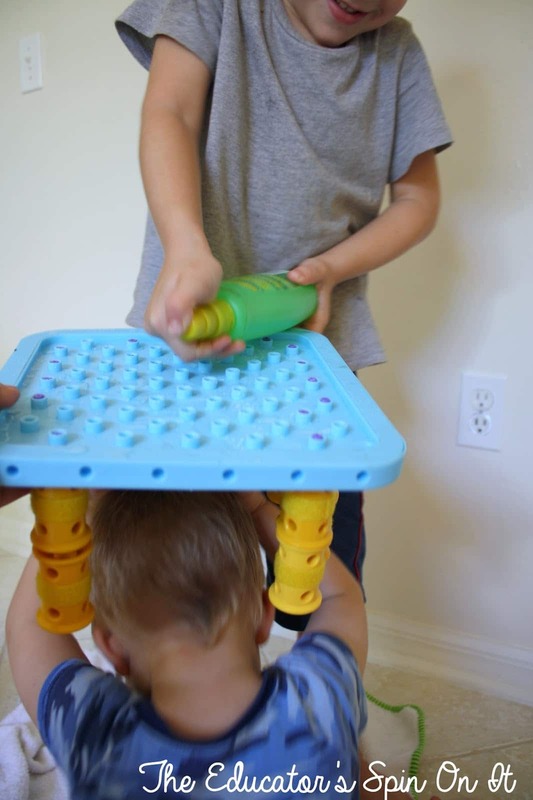 We encourage you to try this activity with the preschoolers in your lives. Then let us know by posting in the comment section how it went. This activity is very open ended. Some children may build for 10 minutes, others 1 hour. Follow your children’s lead. 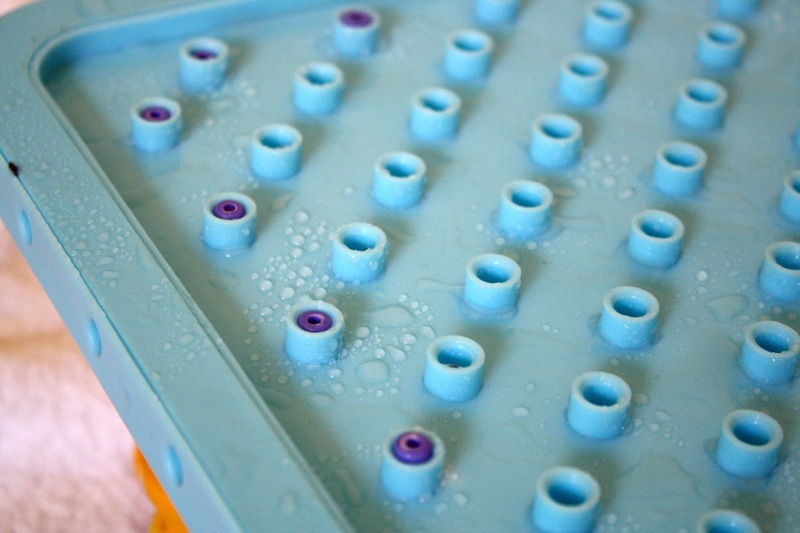 My own preschooler ended up trying the experiment several times…. Build a shelter for a toy that can withstand water. 1. Layout different building materials creating choices to build for the child. 2. Discuss different ways he can keep the toy dry from the water. Ask open ended questions that require him to solve the problem such as, “What can hold a roof up?” or “What makes for a strong wall?” Provide assistance as needed, but let him create the idea. 3. Let him chose the materials they wish to build with for their shelter. It may take patience as they discover which materials work better than others. My preschooler decided to use Goldieblox to build his structure because they are made of plastic. “Water doesn’t go through plastic,” he said. 4. Once the shelter is complete, test it out by squirting with water simulating rain. 5. Check to see if the shelter kept the toy dry. If not, redesign and rebuild the shelter. If you have a younger sibling and don’t trust that the toy may be damp after you have sprayed the shelter. Ask them if they would be willing to “hide” under the shelter to test it out. When the toddler screams “WET WET I WET” as the water drips through the holes, the preschooler gets a great feedback that his first design idea “MAY” not have been as solid as he hoped it was. And so, he skips right from sheltering the toy, to testing out his new shelter on little brother…. Hey – I guess there is always more than one solution to every problem. 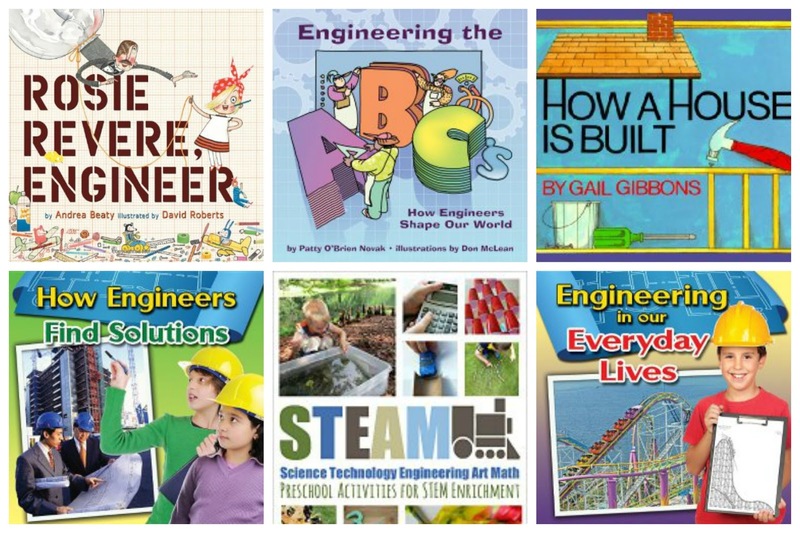 Preschool engineering books for parents, teachers, and children. 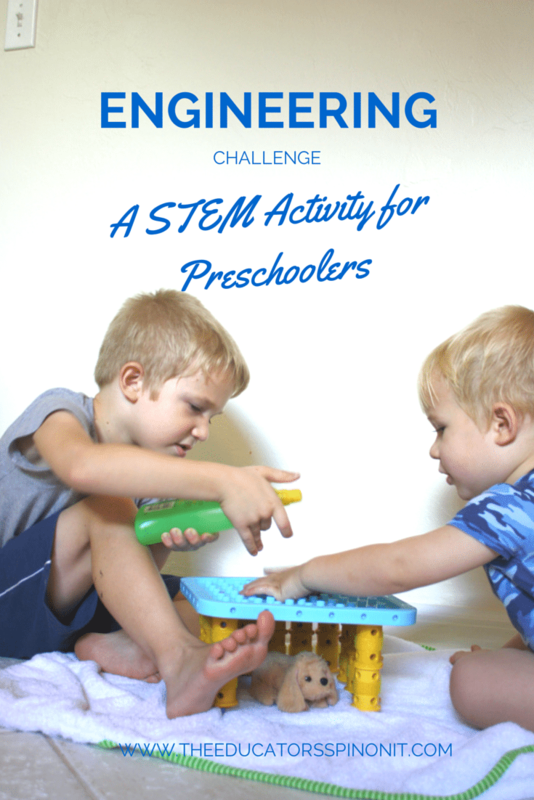 30+ STEM + ART Hands On, Minds On activities to compliment and enrich preschool learning. Children explore the connections between engineering and their daily lives in this non-fiction picture book. Geared for preschool and up, this book introduces children to engineering terminology in a fun and engaging way. A delightful tale showing children how a house is built: from architect to carpenter. Engineers often test solutions to come up with the best one. This book introduces children to the idea of finding solutions and comparing them. Rosie is determined to create something wonderful – but it fails. Find out why a contraption fail, was truely a success. for even more preschool activities. 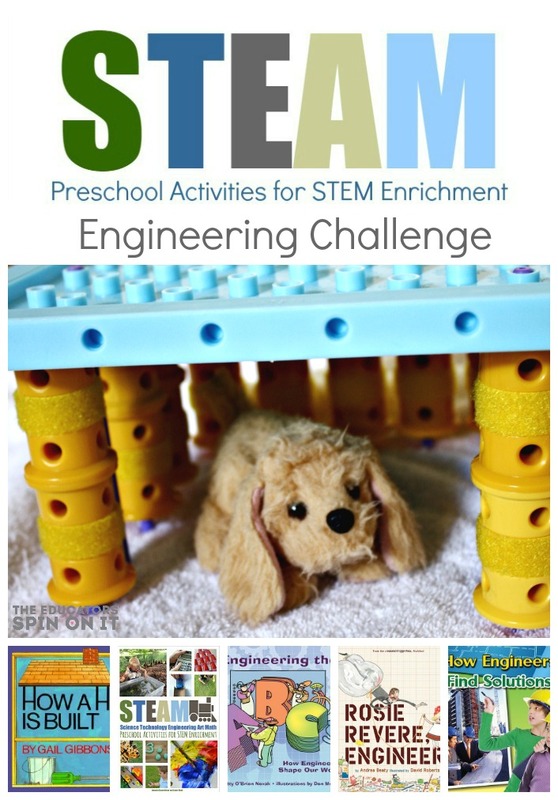 Here are the direct links to purchasing my Preschool STEM E-books. Join us this SUNDAY for the second week of our e-course with a Google Hangout on October 5th @ 8:00pm to hear tips and tricks for incorporating Science activities for your preschooler. We will be discussing, along with Jamie from Hand Made Kid Art, our own personal experiences and tips for using technology with preschoolers. No registration is required, but we would love for you to share in the blog comments how your child did, any observations you made, or other tips on how you are improving that area of academics with your preschooler. Friday 10/24- STEAM Challenges: Pictures and Stories from YOU! 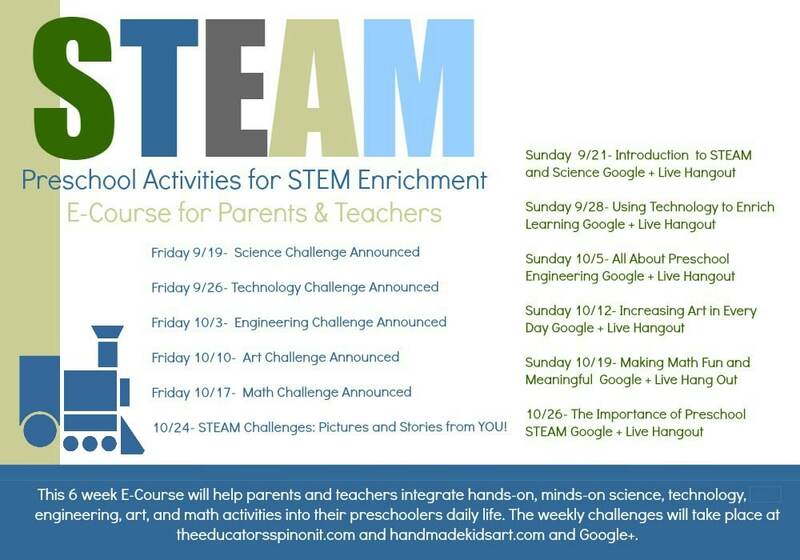 Stay tuned for the other challenges in the free STEAM E-course for Preschool Parents and Teachers. No time to gather your own STEM materials??? Don’t forget to write in the comments what building materials your child used for this challenge. 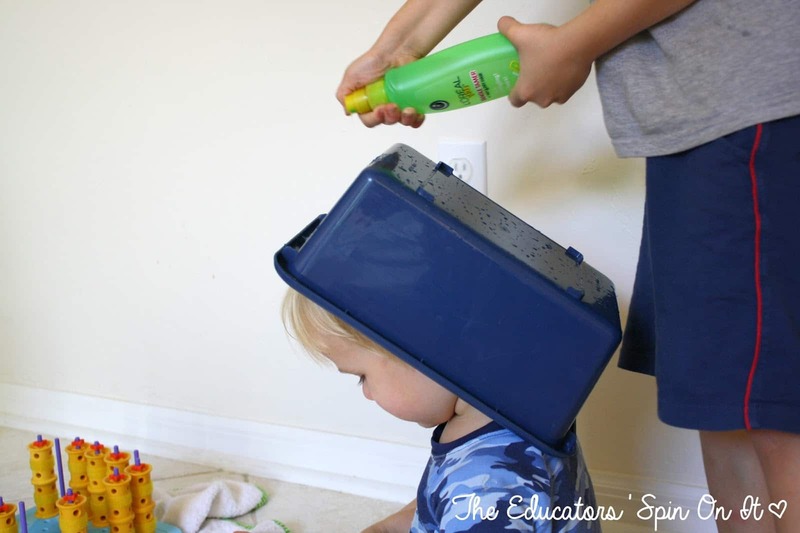 I love the idea of having preschoolers design and build a structure, then test it to see if leaks when sprayed with water. 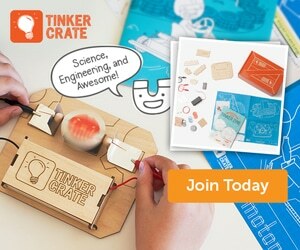 We look forward to trying it out with our little builders!